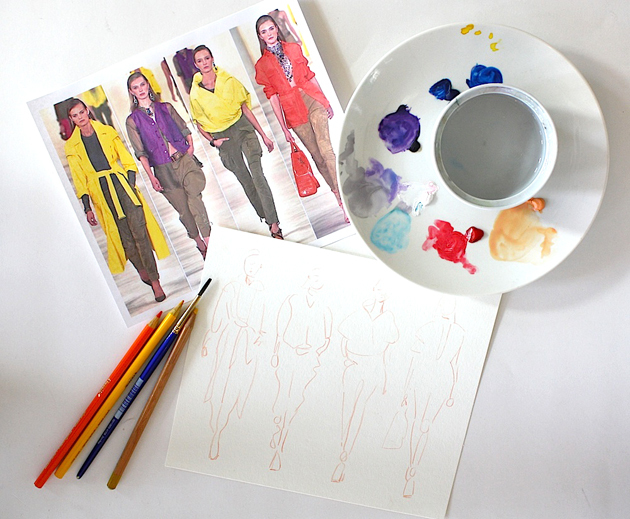 It’s been a while since I posted a DIY tutorial demonstrating my fashion illustration technique! 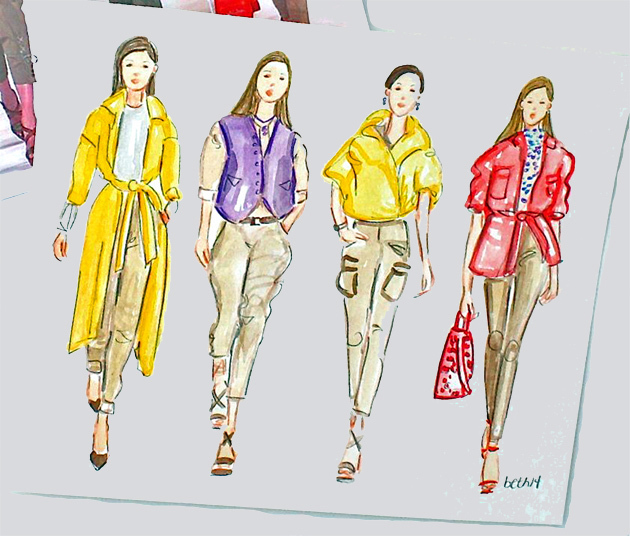 Today’s post features a step by step guide to creating a watercolor painting featuring runway looks from Ralph Lauren pre- fall 2014……I love the strong, spicy yellows! First, gather your supplies including watercolor paints (I use a dry palette), watercolor pencils, a paintbrush, water, a porcelain plate for mixing, a photograph from which to work, a sturdy piece of watercolor paper and a light box or sunny window if your drawing skills aren’t strong! Next, using a flesh colored pencil, lightly outline the major shapes……. 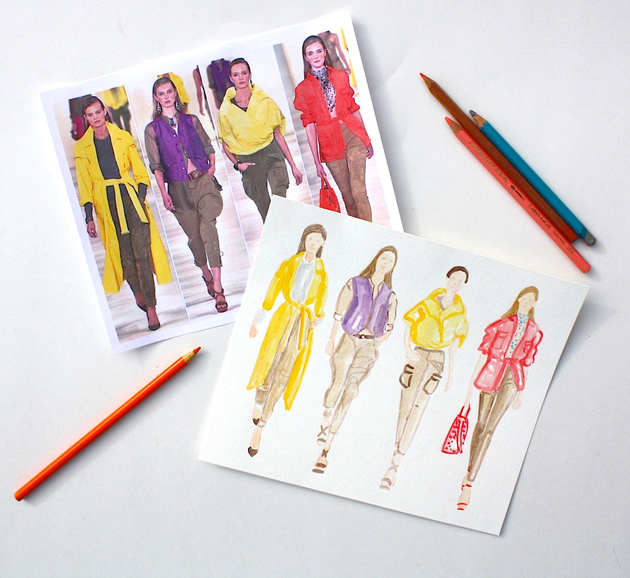 Once you have established the foundation of the illustration you can add details with bolder strokes of paint and your pencils……The key to a fluid drawing is to work quickly and not worry about mistakes! 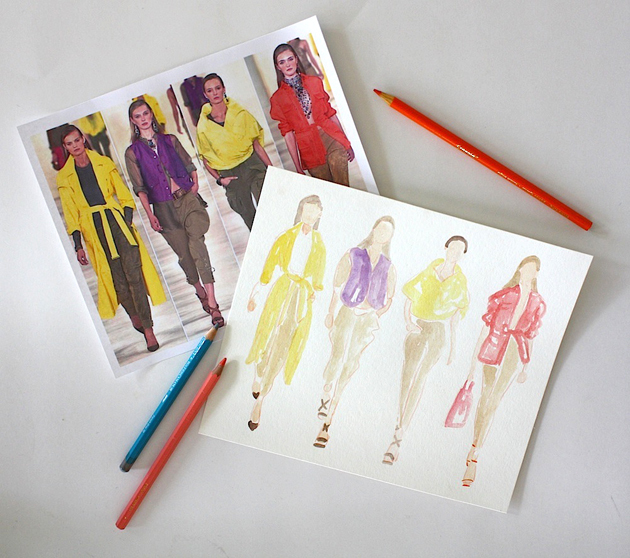 Leave a lot of white areas if you can……The beauty of watercolor pencils is marks are easily erased with a quick wash of water so have fun with it! A quick tip on drawing faces: I use a very sharp lead pencil to create eyes and a smudge of flesh colored paint or pencil to create the nose and mouth…. I will often leave the background white and then fill in a color using photoshop for my digital presentation. Either way this is a fun project you can try using any photograph and I think you will enjoy seeing your own unique style emerge as you try this technique!